Tonight, Halloween 2017, the stage play of William Peter Blatty’s apocryphal horror story The Exorcist opens in the West End at the Phoenix Theatre. 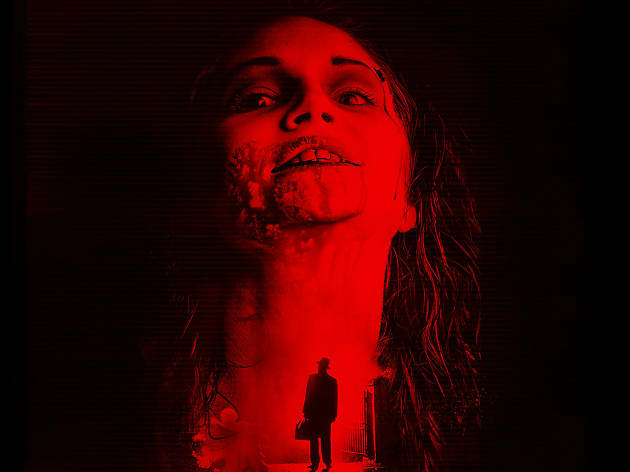 Directed by Sean Mathias, the story is all about 12 year old Regan MacNeil, a girl from Georgetown in Washington DC, whose becomes possessed by Devil. The play stars Jenny Seagrove as Regan’s mother Chrissy, and Peter Bowles as Father Merrin, the Jesuit priest whose mission is to exorcise the young girl of her demon. 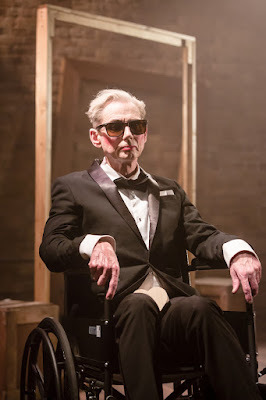 I saw The Exorcist when it first played at Birmingham Rep (who alongside Bill Kenwright are co-producing this London transfer) last year. It was a great night at the theatre, but what struck me then, aside from the starry lead performers, was the fabulous work from Clare Louise Connolly who plays Regan. 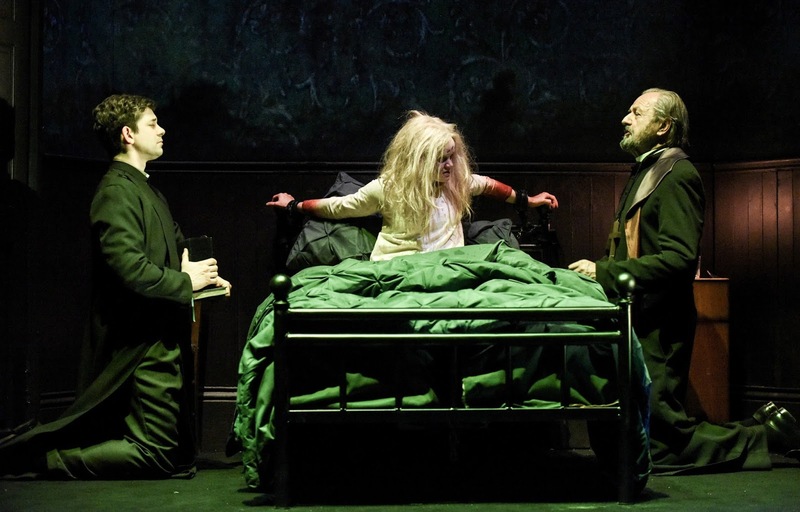 The Exorcist play may well be dripping in world class special effects and illusions – but at the heart of this gruesome horror story is quite simply a breathtaking performance from one of the country’s finest young actresses. As rehearsals were ending, I caught up with Clare to talk about the show. JB: Tell me about the build up last year to your being cast as Regan. Clare: I had, probably, about four auditions, and I did a lot of work to get the part. The story shows a really good character arc the story has such a cult following, that I wanted to make sure that I gave the part justice in the auditions. We worked a few scenes during the audition run, including the iconic movie moment where Regan spins her head around. I made sure I told our director Sean Mathias that my neck was extremely flexible! JB: “Iconic” is a word that’s over-used today but it’s entirely appropriate in describing the impact that The Exorcist has made on movies and the horror genre in particular over the last 40 years. Did you use William Friedkin’s movie to prepare for the audition process? Clare: Good question. Not very much at all. I knew I'd watched the film years and years ago, but I didn't actually watch it again before I auditioned because I wanted to make the character my own. When I read the scripts, I was really excited because it's written so well that I just wanted to bring my own truth to it, rather than be an imitation of Linda Blair who played Regan on screen. JB: Filming the movie famously took its toll on Linda Blair, with Friedkin demanding countess retakes of some of the most harrowing scenes. You, of course, are telling, the same story, but in a very different, live medium where, like all theatre professionals, you have to get it right, first time, every time. Having seen the show last year in Birmingham I can confirm that your performance is magnificent and convincing. Do you enjoy horror as a genre? Clare: I do. I didn't used to but then I watched The Orphanage that I just thought was so beautifully done. I'm not a massive horror fan per se, I don't seek them out so much, but if there is a horror film that I think, "Oh, that looks interesting " then I’ll watch it. The Ring is when I think horror movies turned and really started to get back in the public eye again. But, in preparation for The Exorcist I have watched more horror. Clare: Yes, but it also needs truth. It has to make it real and I think that's the success of The Exorcist. It is such a domestic story, and you can really imagine how these events could potentially happen. There is also a strong focus on mental health in the narrative. Chris struggles with guilt and worries that her daughter feels abandoned. Father Damien(Adam Garcia) also struggles with guilt over abandoning his mother before she died. Uncle Burke (Tristram Wymark) is dealing with addiction, so there's a lot of themes that are relevant to today. JB: Some people say that violent horror, when portrayed as entertainment, “sets a bad example”. Do you have a view on that? Clare: Yes - I do feel quite a responsibility to a story well and to take the audience on a journey. One thing The Exorcist does talk about is that where there's evil, there's also good. I think people like to have their dark side challenged and I know that the response of the audiences has been amazing. JB: Tell me about the audience responses - without giving too much away of course. Clare: Well there are a couple of jump moments of course but it's not really about that. There is a moment where the audience get quite loud, and shocked that we can actually pull a particular effect off on stage - Ben Hart’s illusions are amazing. The audiences have been incredible and I think people are very excited that, actually, we go there on stage! They don't expect to see my head turn. They don't expect to see things fly across the room. They don't expect these things. And, although they know it all happened in the movie with Hollywood’s special effects, they don't expect that many things to happen in front of their eyes, so I think they are very excited that those things happen. JB: Do you enjoy hearing their screams? Clare: Actually, no! I have to really concentrate to not absorb that energy and that’s a big thing for me. As a person I'm quite empathic, so, if I hear somebody screaming, my feelings are that I want to protect them! 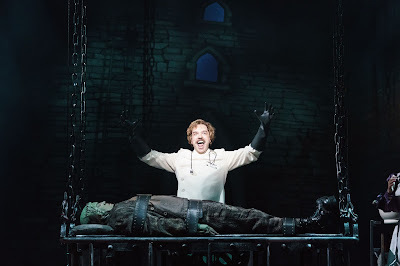 JB: The show has opened on Halloween, which is very much nowadays a season that treats horror with a fair amount of tongue-in-cheek frivolity. But even though The Exorcist may well be "popcorn-theatre", it is not in any way a pantomime, or a show that can allow its cast to interact with the audience. Clare: "Popcorn theatre" is a great description. We've actually had women come along to see the show dressed as Regan! So who knows - we might have the beginning of a cult show here. What I do know though is the genius of John Pielmeier's adaptation that allows a lot of comedy in there too. There is the time for the audience to laugh, and it might be right before they’re meant to feel scared, so it really throws them back and forth. 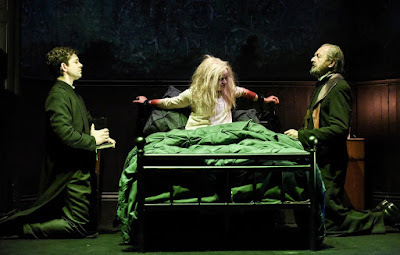 The Exorcist audiences have been the loudest I've ever experienced doing a play, in fact they probably are on a level with pantomime audiences. It’s a real experience for them and so far they all seem to be loving it, lapping it up and coming out afterwards really exuberant, bright eyed and with lots to say. Another key part of the show’s magic for me is the sound. When I landed the part, the first thing I wanted to find out was who was designing the sound, because, for me personally, it is the sound affects that complete the illusion. When I learned that it was Adam Cork - who I've worked with before on something else that was also very distressing and horrific - I was like, "Brilliant. We're okay. He's fantastic." And, when you enter the theatre and you've got that haunting chanting sound, it just puts you on edge to begin with! JB: The possessed Regan literally looks horrific. How long does it take you in make up to get that face just right? Clare: Make up is actually an amazing challenge, because it’s a gradual process throughout the show. I start clear faced, no make up, just as Regan starts off as a normal happy girl, who has a great relationship with her mother. So it’s a gradual build-up. On the brief moments when I'm not on stage, there's a brilliant lady called Billie Sanger, who is adding make up to me, slowly, and that's how it happens. JB: And you are not off-stage for very long at all. Clare: I know. Most of my changes are about 35 seconds. I think I might have one that's about a minute and a half. And they're very quick. And I do change my nightie a few times as well. Very quick changes. JB: Let’s talk about Ian McKellen and THAT voice. Last year in Birmingham it wasn’t announced that he was voicing the devil and in fact he didn't even get a programme credit. Now, with the London opening, his part in the show is well publicised. What’s it like to lip synch to Ian McKellen? Clare: Fantastic. An absolutely dream.There are certain people you really want to work with in your career and he’s at the top of that list. Even though his voice is recorded, we did rehearse together so as to make sure that the cadence of what I was saying and rehearsing matched his cadence, rhythm and speed. I didn't actually know it was to be him voicing the Devil until the read through! I met him about 10 minutes before we commenced and then started acting with him and it was just brilliant. He's such a legend and yet I immediately felt calm working with him. What’s great about Ian's voice is that people recognise it. This in turn makes it all the more believable as to why Regan takes him on as a friend. If he’d been voiced as a gruff, mean sounding villain, she wouldn't have given him the time of day. Ian’s Devil however is smooth and he just entices her in. And of course the rest of the cast are amazing to work with too. It's been such an ensemble piece with everybody throwing in ideas. Sean really likes to take a collaborative approach. JB: Clare, thank you finding the time to talk. To you and to the whole Exorcist company, break a leg with the run. Clare: Or break a neck! 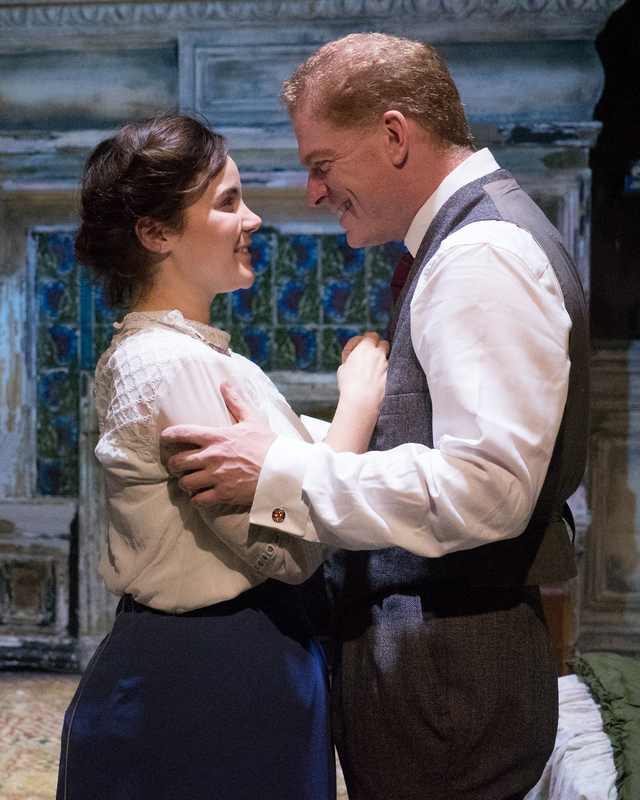 Tryst is a play that cleverly and chillingly explores domestic abuse. A charming man may often be the most feared by women as there is a risk that through a subtle combination of power and control, he may both captivate and ensnare his victims, with it sometimes taking months or even years to uncover the hallmark characteristics of his terror. Tryst, by contrast, is set over a few days. And, more importantly, the true colours of the man in question are proudly displayed to the audience from the get-go. Superficially, the premise is simple: boy meets girl. But it’s not so much that simplicity as rather ‘crook meets his mark.’ From the outset the play is completely transparent. The crook in question, George (Fred Perry), informs the audience of his plans for his next target, quickly revealed to be Adelaide (Natasha J Barnes). She is consigned to working in the back of a milliner’s shop, because, like the other girls forbidden from gracing the shop floor, there’s “something wrong” with her. This gaping chink in her self-esteem, along with her fiscal assets, makes her an ideal target for George. The first half of the production weaves a tale of rapid courtship, told through a combination of rapidly changing separate monologues and interactions between the two characters. It’s a dynamic that is mirrored by the interplay between Matt Drury’s lighting design and Max Dorey’s set, serving to amplify the tension. As the story progresses, layers of Adelaide’s character are unwrapped, each revealing something even more endearing. George follows a similar trajectory but with one striking difference – he has laid out his modus operandi in his opening dialogue. Delivered in an authentically cold and calculating manner, it is difficult to forget this and consequently, to be entirely pulled into the transformation that he pulls off. The parallel that comes to mind is one of a magician revealing his tricks; once done, it is near impossible for the watchful viewer to truly forget them. In a two-character play, the audience needs to fully believe in both protagonists. Adelaide undertakes a journey of personal growth, peppered with a shrewd observations and self-awareness. 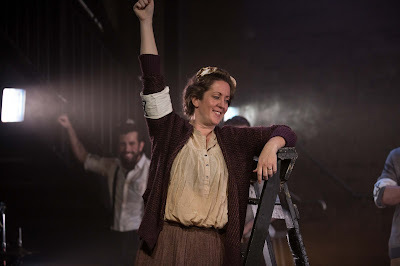 She’s immensely likeable and in a magnificent performance Barnes’ portrayal of a complex young woman sees the actor continually digging into the depths of her emotional reserve to keep the audience fully vested in her story. George, on the other hand, never entirely crosses the bridge into believability – this is both a relief (for that would make it unbearably dark) and a shame, as it feels that this might have been always the intention. The script is beautifully crafted, moving at a pace that flits between thundering forward to reflect the fast passage of time and pulling back to uncover a multitude of truths. 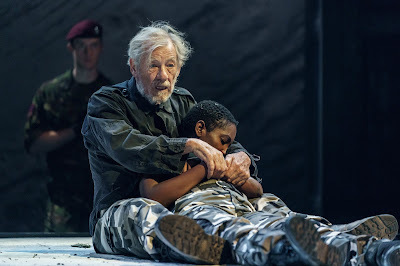 And it’s this concept of truth and reality – and by extension, trust – that lies at the heart of this play. It is impossible to view Tryst outside of the very current lens of sexual harassment and assault that are currently dominating the media; particularly the strand of debate about the situations that sit along this spectrum. It provides the play with a framework that makes for particularly uncomfortable viewing, especially given that this play is set in the Victorian era. The newly-renovated Tabard Theatre, situated opposite a church and a park, is an ideal home for this production on a dark and windy October’s night. Tryst stays with the audience long after the end of its 90 minutes, as any great thriller should do. It pervades the mind and through the select questions it leaves unanswered, bequeaths a haunting legacy. Transferring down from Manchester’s Hope Mill Theatre, Jonathan O’Boyle’s production of Hair is an exciting revival of a show that was to define so much of the 1960s. Following a “tribe” of Manhattan hippies Gerome Ragni, James Rado and Galt Macdermot’s musical explored a range of modern music genres as a narrative evolves that focuses on racial integration and social and political challenge. The story plays out under an overarching theme of copious drug consumption in New York while on the other side of the world the much loathed Vietnam conflict rages. 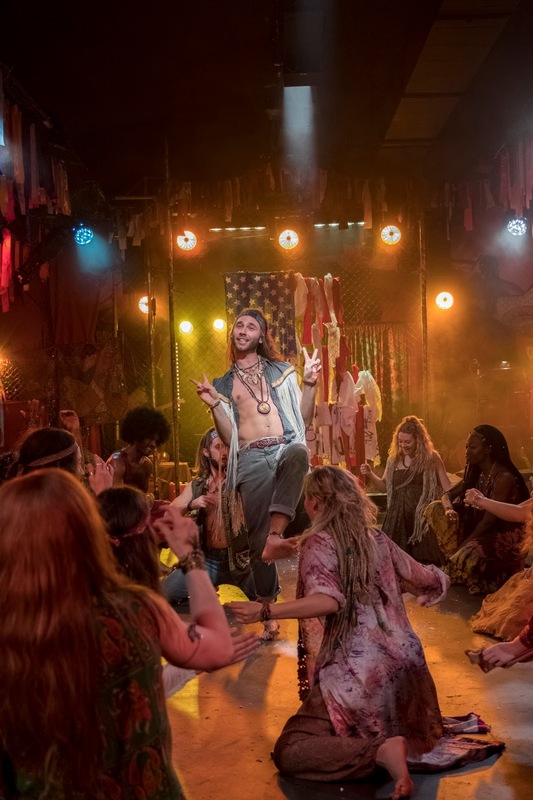 Hair blazed a trail for challengingly political musical theatre - indeed, swap the slaughter and sacrifice of Vietnam for the ravages of HIV and Hair becomes an arguable precursor to Rent. While the show’s themes remain noble in intent, Hair is very much a museum piece. A Trump themed intro (and even a re-written song from Rado to reference POTUS #45) fail to convincingly shift the show’s message into the 21st century though perhaps this is not surprising with the nature of protest itself having changed over the decades. Fuelled by the internet and social media, the world has evolved into a far more cold and cynical place from the flower-powered idealism of 50 years ago. That being said, Hair remains a cracking cultural milestone and while Ragni and Rado’s cooky storyline is probably best savoured under the influence of (modest) intoxication, it is clear that O’Boyle has assembled a stunning company for his revival of a show that is packed with iconic songs. In what is very much an ensemble piece that demands a strong company throughout, the Tribe are led by close friends Berger and Claude. Berger remains committed to the peace-loving hippie cause as the show’s arc sees Claude ultimately enlist. 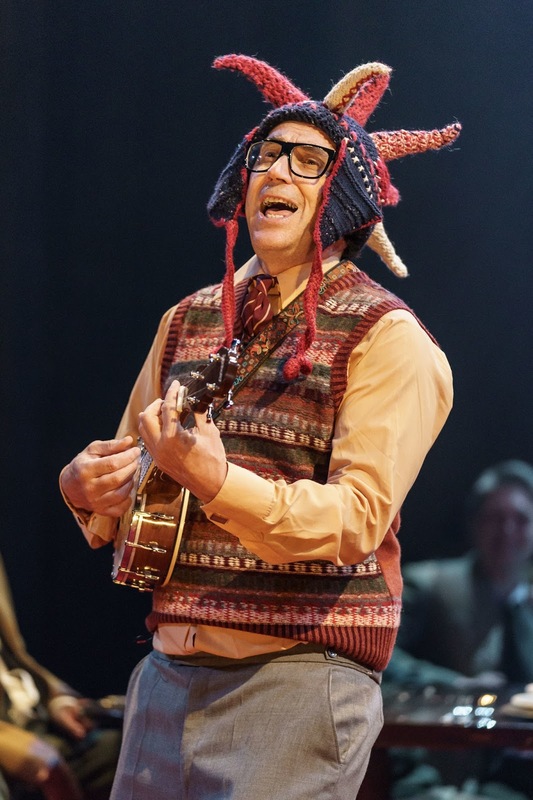 Andy Coxon brings a commandingly lithe power to Berger as Robert Metson’s Claude presents a far more complex character (albeit one who can give a gorgeous Mancunian twang to Manchester, England!) While we may not understand Claude’s motive for enlisting, Metson ensures that at all times his character demands our sympathy. The casting is excellent and at times, sensational. There is standout work from Shekinah Macfarlane whose Dionne kicks off proceedings with an ethereally energetic Aquarius. Laura Johnson's Sheila accompanies herself on guitar in a heartbreakingly gorgeous interpretation of Good Morning Starshine while in the first half, a white gloved Jammy Kasongo as Hud briefly electrifies with Colored Spade as Natalie Green puts in a tiny, perfect cameo as Mom. The driving energy of this revival is powered by Gareth Bretheton’s 5 piece band and especially Tom Hutchison’s stunning work on drums. Macdermot’s melodies span a range and fusion of styles and in one of the most impressive bands to be seen in off West End theatre for quite some time, Bretherton gives the score and the show a pulsating, rock-based intensity. As a venue The Vaults is potentially perfect. Draped in ribbons and yet, literally tucked under the rumbling tracks of Waterloo Station, it hints at the grimy squalor of a squat. 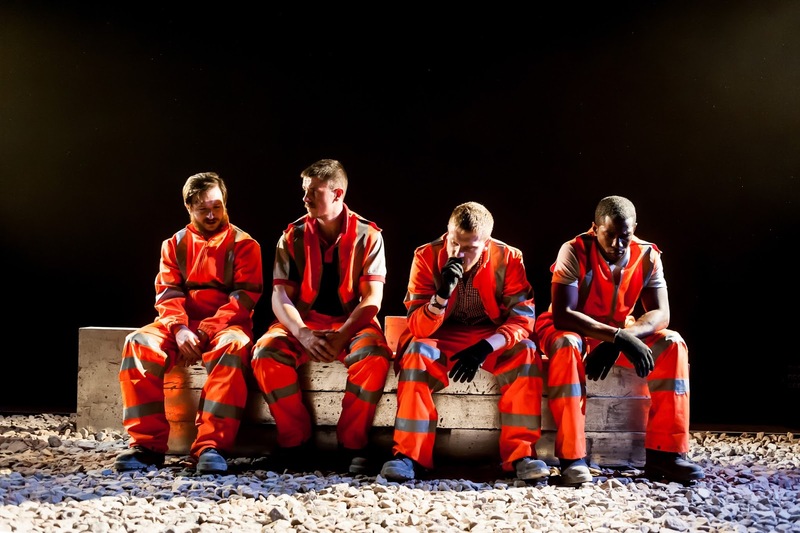 Acoustically however, the challenges of a railway basement have been well addressed with the show’s sound design (Calum Robinson and Max Perryment) proving virtually perfect. 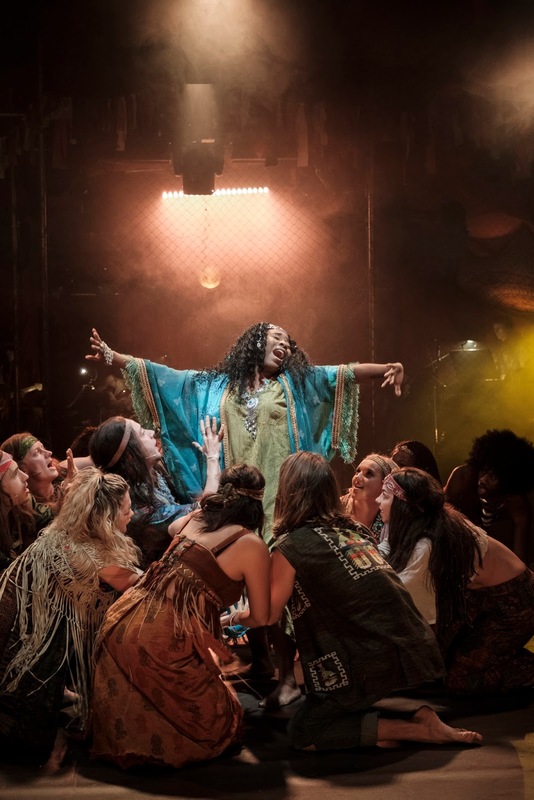 For some in the audience Hair will offer nostalgia, for others chance to discover, or re-discover, a musical that was to break the cultural mould in so many ways, in the process giving rise to some modern yet timeless numbers. It’s a great night at the theatre. 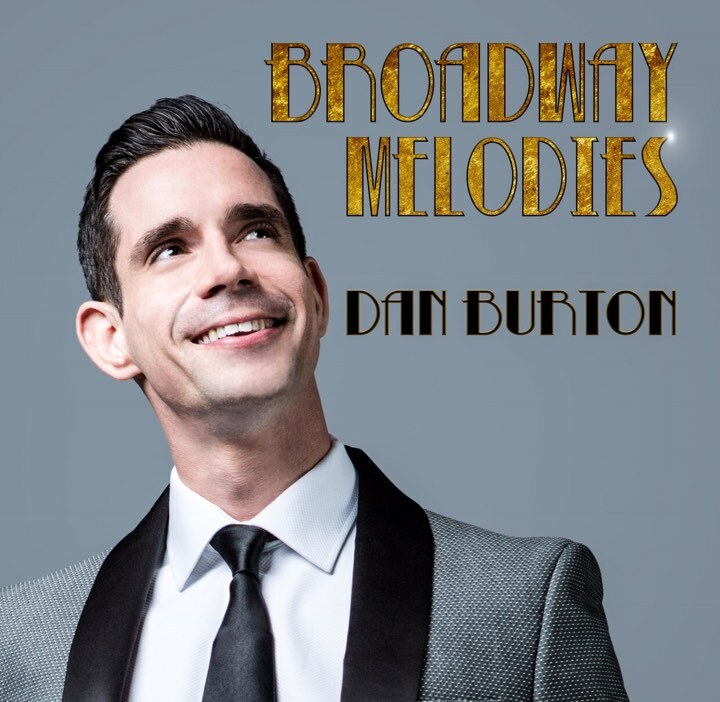 It is a delight to review Dan Burton’s debut album Broadway Melodies. As choreographer Stephen Mear has long known, Burton is currently amongst the finest of musical theatre “triple threats” (defined as talented in all three skills of song, dance and acting) and a man who unassumingly provides an assured touch of class to all his roles, whether they be leading or support. Recent years alone having seen him give an assured Tulsa alongside Imelda Staunton’s Momma Rose in Gypsy, an immaculate Billy Lawlor in a Parisian 42nd Street, with Burton only recently having closed a flawless (and sold out) run as Jerry Travers in Top Hat at Kilworth House. Those three shows on their own define Burton’s affinity with and affection for the classics from The Great White Way, so there is a true sense of belonging in listening to the singer’s choices – a selection that also bears a distinctly autobiographical touch too. Burton opens the album with Singin’ In The Rain (he’d played Don Lockwood at Paris’ Chatelet a couple of years ago and keen fans may care to visit Paris this December where the show is soon to return) and gives the timeless number a warmly respectful treatment that drips with the comfort he feels in the role. The song is one that’s known by literally everyone and yet Burton still imbues it with a loving freshness - and there’s a cracking trumpet riff too from Gethin Liddington. Chichester’s production of The Pajama Game from a few years back transferred, with Burton, to the West End and so it is little surprise that the show’s Hey There features among Burton's chosen ten songs, with his gorgeously mellifluous interpretation makes this number arguably the album’s highlight. Scaling Richard Adler’s and Jerry Ross’s intoxicating key changes with a charm and a confidence, Burton makes one want to set the track to ‘repeat’, to fully savour an enchanting three minutes of song. There’s a delightful note of comedy as Burton teams up with Lee Mead for Well, Did You Evah. Crosby and Sinatra will always be a tough act to follow but there’s well-rehearsed nuance in this recording and one still cannot help but chuckle at Burton and Mead’s take on the tried and trusted gags. The entire collection is a treat, with amongst the other songs included are a fabulously sonorous I Only Have Eyes For You and a perfectly pitched I’m In The Mood For Love. Sensitively produced by Mason Neely, Broadway Melodies is a must for anyone who loves exquisitely sung show tunes. The album is but a gorgeous glimpse of Dan Burton’s talent and with Xmas just around the corner, could well make a perfect gift. JB: David , what attracted you to write The Toxic Avenger? DB: Joe DiPietro and I, my writing collaborator, we were working on Memphis - a big epic story about the birth of racism, and the birth of rock and roll. We had done some productions of it, and then we were waiting for it to come onto Broadway when Lloyd Kaufman, the man behind Troma Films, he came in and pitched the idea about doing a musical. So Joe wrote a treatment for it and asked : “can we make it the way we want? Not, the story from the movie," and Lloyd agreed. So we set to work and it was a chance for Joe and I really to write comedy. It's funny as hell, there's an underlying love story, and the moral of it, still, is about global warming. But, it's all set in comedy, and it was a blast. We did it really quickly, and it was great fun. JB: The Toxic Avenger is all about satire. What satire and humour appeals to you and who were your comic influences? DB: It's funny, Joe and I, we're the same age, we're from New Jersey, and grew up on the same comedians. When I grew up I had more comedy records than rock records! Growing up it was Eddie Murphy. And then the Saturday Night Live crew was just funny as hell. But, I always loved the side of comedy that was just an intelligent way of looking at things from a different viewpoint. It's great, and it's a great thing to watch people laugh. Laughing is a great therapy. JB: The Toxic Avenger is very politically incorrect. How important is political incorrectness in modern comedy ? DB: What I think what we did with our piece, was that we mocked everybody. We took the piss out of everybody and everything that we could. We mocked everything, so no one could accuse of us of bullying on any one angle. If you mock everything, then it's funny. JB: Do you sense any trend in how comedy today is shifting? Do you feel that there is a greater sense of what can and cannot be laughed at in today's era? DB: The comedians are the ones that are supposed to push the envelope. All my favourite top comedians were the ones who did push that envelope, and say stuff that everybody thinks, but doesn't want to say. I don't have a problem with that as long as it's done in an intelligent way. 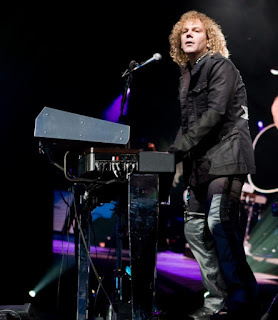 JB: You’re famous for being the keyboards player in Bon Jovi. Tell me the difference between writing songs for a show and albums for a rock band. DB: Same thing. It's just writing a song. I don't do any research. Joe and I sit down and go, "Okay, here's the character, here's the dilemma, or the journey, or what's the purpose of why this character needs to go from point A to point B, and what's driving him?" I think it's really a human story, if you will. I just put myself in the shoes of that character, and just write it, and let it all come out. JB: A good musical has a very clear book that the songs work around. How does the creative arc compare of writing songs for a show compare with the arc of writing songs for a Bon Jovi album? DB: Yeah, anytime we approach an album, it's always a beginning, middle, and end and there is a narrative. In a musical, you have different characters and it’s a little more challenging writing for men, for women, for monsters (!) - it's a whole different world. But the songs and the story keep evolving together. It's not like one's written in stone, and then the other isn't. We are the kind of writers that don’t just go, here's the story, and now we're going to step out of the side of the story, and here's a song. Our songs always push the characters ahead. JB: Within Bon Jovi do you contribute much to the composing? DB: Yes! I classically trained for 15 years, so I understand music. It's really helped in that that is what really separates us from a guitar band, and then you add keyboards. All the big songs that we've had in records, with keyboards you can colour the emotion, really paint a picture. Even in the beginning ... A standout example would be, Wanted Dead or Alive. At the beginning you hear wind, and strings, and all of a sudden you're in a Western. That's what I bring to the table and I love it. JB: David, thank you and I wish The Toxic Avenger every success at the Arts Theatre.